I have been a little quiet these past two weeks due to just immersing myself into the month of Fast. Today is officially half way – with less than 15 days left of this auspicious month of Ramadan. I felt now was a good time to discuss something that perhaps now more than ever people are distorting and that is the size of their portions. You have no doubt been over indulging in all the savoury delights and sweet treats not to mention hearty dinners that follow that Iftar (breaking of fast table) table. Even if you are not Muslim and are not fasting, we all know those times when we throw all good sense out the window and stuff a lot more down our gob than we probably should. Allow me to be the voice of reason for all of us guilty of over indulging. I want to provide you with a simple guide to measuring your portions without having to carry a scale with you everywhere you go. Weight loss is a simple equation – if you eat more calories than what your body can burn in a day even after exercise – you will not lose any weight. With the same token, if you burn more calories than what you are consuming – weight loss is inevitable. A healthy, portion-controlled eating plan means you take in fewer saturated and trans fats, added sugars and refined flours, which are conducive to weight gain. 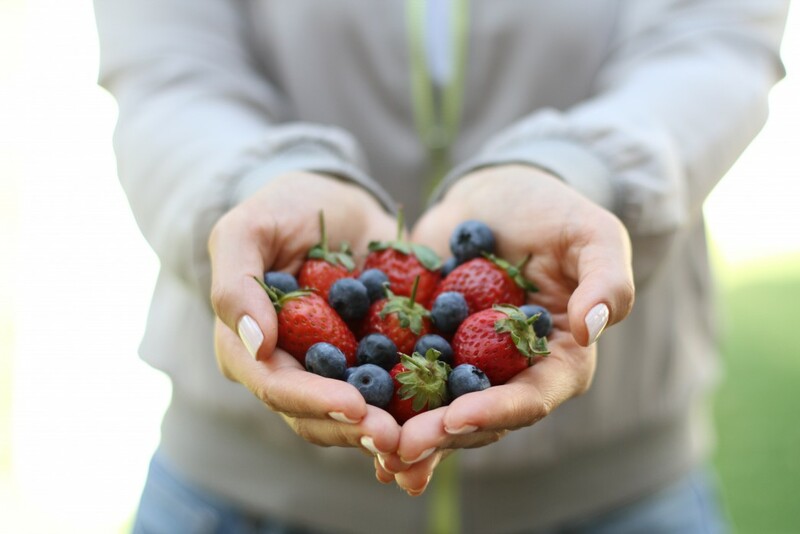 A healthy eating plan reduces your risk of developing chronic diseases and improves your energy. Even losing just 5 to 10 percent of your body weight can have positive health implications. Portion control is also essential, however. You can easily over eat healthy foods to create a calorie surplus and gain weight. You can easily out-eat your exercise efforts. Without dietary control, weight loss will not occur. 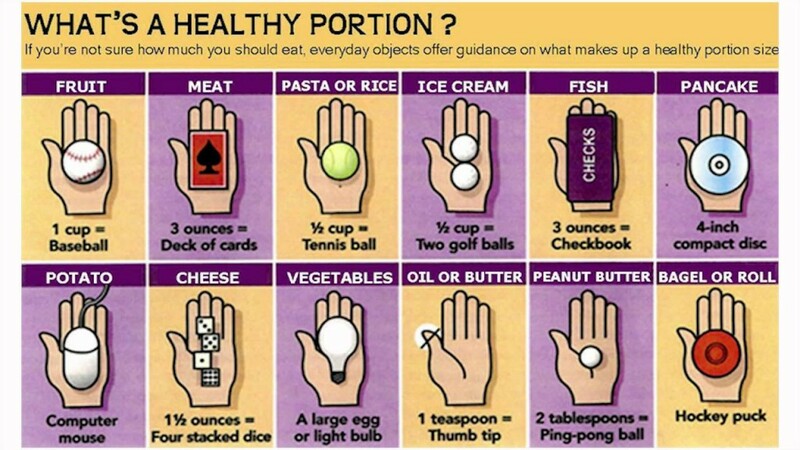 Familiarize yourself with what healthy portions look like. It’s easier to visualise portion sizes in comparison to objects. Here are a few to keep in mind that will make it easy when you aren’t home and able to measure: 1 cup of yogurt, cereal, soup or pasta is equal to the size of a baseball; 3 oz. (75g) of most cooked meat is equivalent to a deck of cards; 1 sandwich on regular sliced bread is equal to two decks of cards; 3 oz. of cooked fish is equal to the size of a cheque book; and 1 cup of lettuce or cooked veggies is about the size of two palms of hands. A few other cheats are to use the tip of your finger (from the first joint up) as a teaspoon and your thumb as a guide for a tablespoon. Jot these down on a piece of paper and keep it in your wallet until you start to commit them to memory to make measuring easier. Use smaller plates. A recent study from Cornell University found that people who ate off of smaller plates believed that they were eating an average of 18 percent more calories than they actually were. No plate that you eat off of should be the size of a platter, or a restaurant-sized plate. Your dinner plate should be no bigger than 10 inches across. Try using your salad plate as your main dinner plate. Here is a little trick: Before your food comes to the table, I ask the waiter to wrap half of it up in a doggy bag. This way you have two meals for the price of one and only half the calories! Another way to cut calories is to always share your dessert with a friend. So I am hoping this will help you curb those portions and not self sabotage your health and weight loss goals.